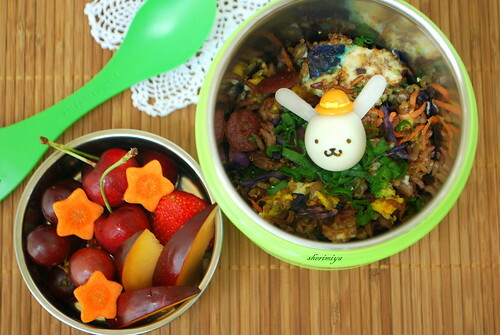 Bunny Fried Rice Bento, originally uploaded by sherimiya ♥. You are the BEST at quickie, beautiful and nutritious bentos! 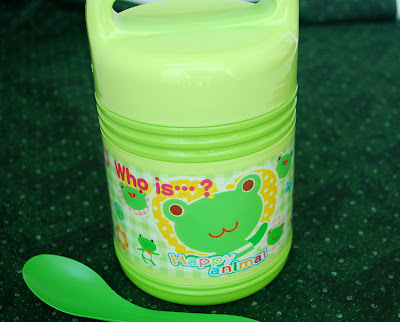 I LOVE that container. I saw a similar one a few days ago but not as cute. So I didn't buy it lol. Love that little hat on the bunny.. cute! Oh my goodness that's an adorable lunch bucket! Thanks Yenny, karaimame and Sonoma Bento! Hi Susan! Thanks a lot for stopping by with nice words! i love catching up on your bentos, they give me so many ideas for yummy and quick meals. fried rice is one of my faves and yours is always slightly different but still delicious. the bunny and carrot stars are such cute finishing touches!